"Only a Pompeii and a Herculaneum were needed at the foot of Kīlauea to make the story of the eruption immortal." - Mark Twain, "Roughing It"
We hike over the miles of moonlit lava rocks, to the base of the volcano, the glowing crater above us. 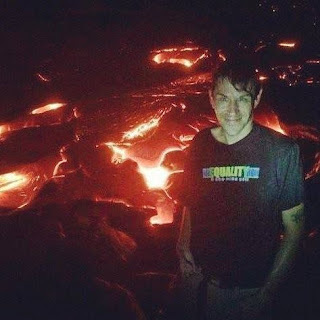 What are the odds of a girl from Brazil, Australia, California and a queer ex-Amish poet gathering at the Kalapana lava flow? Nambe sings a spiritual song about creation and giving thanks. Molten lava flows around and beneath us, bursting through rocks and spilling into the rainy night. On the way back I fall, Pele kissing me as a "kumu" later tells me. I carry a scar beneath my eye today. We get lost on the way back, wandering for hours over the onyx landscape. A flashlight beams at us suddenly. "I'm Nate the Great from Wisconsin but at the moment I'm not so great - I'm lost." Nate the Great from Wisconsin joins our caravan as does a couple whose cell phones guide us to the road, well after midnight. Nambe holds my hand the entire way. Nate is reunited with his friends and we walk the road back together. Back to the moments at the flow, huddled near the lava's warmth against the cold rain. Back to Nambe's song. Back to the fiery streams. James Schwartz is a gay ex ‪Amish‬ poet and slam performer. His poetry has been published by various poetry journals including Poetry24, Politiku, @7x20, Babel: The Multilingual Multicultural Online Journal, The New Verse News, Nostrovia! Poetry, piecejournal, Silver Birch Press blog, Diversity Rules Magazine, Eris Magazine, WritersResist.com and Science of Mind magazine.